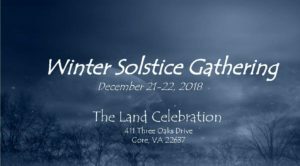 Join us for our TLC Community Winter Solstice gathering. We welcome winter with an evening of fellowship beginning at 7pm. Please bring a dish of lite party fare to share. At 8pm we come together for a circle of contemplation, sharing, and ritual to honor the Season.